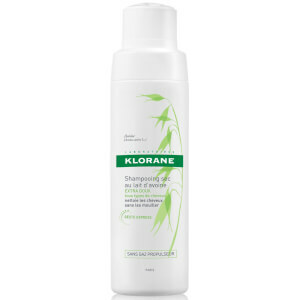 Designed to help decrease the frequency of washing hair, the KLORANE Eco-friendly Dry Shampoo with Oat Milk gently cleanses hair by effectively absorbing dirt and product build-up. Suitable for all hair types, the shampoo helps your locks regain volume and bounce, leaving them looking luscious and refreshed. The shampoo spray is enriched with an extract of Oat Milk that moisturises, softens and protects your hair thanks to a healthy high content of lipids and vitamins, whilst a blend of highly absorbent micronized powders soaks up dirt and sebum on the scalp. Hair volume and texture are restored in just 2 minutes. Hypoallergenic. Free from parabens and colourants. Shake well before use and spray evenly 10 inches away from hair roots. Leave for 2 minutes and brush hair thoroughly. Butane, Propane, Isobutane, Oryza Sativa (Rice) Starch (Oryza Sativa Starch), Sd Alcohol 39-C (Alcohol Denat), Aluminium Starch Octenylsuccinate, Avena Sativa (Oat) Kernel Oil (Avena Sativa Kernel Oil), Benzyl Salicylate Cetrimonium Chloride, Cyclodextrin, Cyclohexasiloxane, Cyclopentasiloxane, Fragrance (Parfum), Hexyl Cinnamal, Isopropyl Myristate Limonene Silica.